Hello! 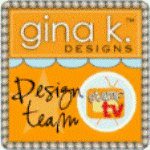 I am so excited to be a guest designer for the Stamp TV kit this month. 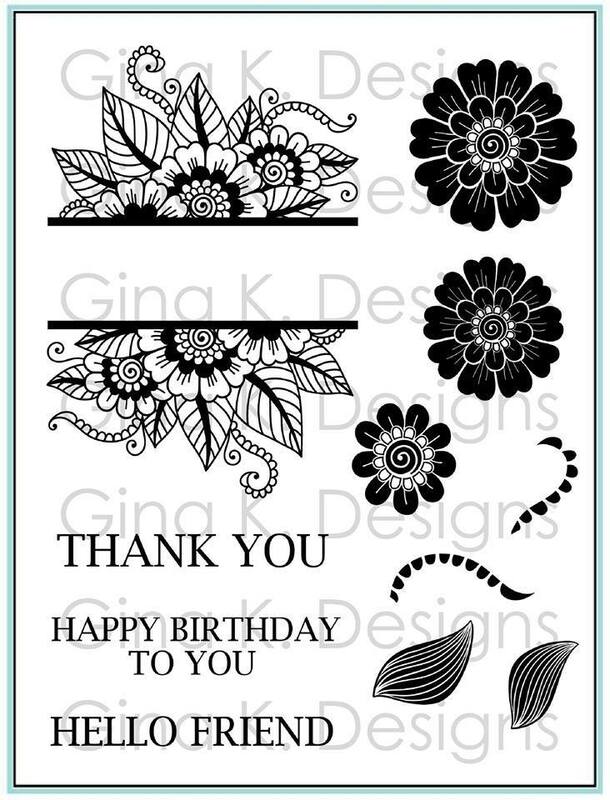 Today, the Cast and Crew for Gina K Designs welcomes you to another fabulous blog hop celebrating the new StampTV Kit! We hope to inspire you with some beautiful card projects as you hop along to each of the designer’s blogs! Today, we are featuring the first stamp set called Bold and Blooming. 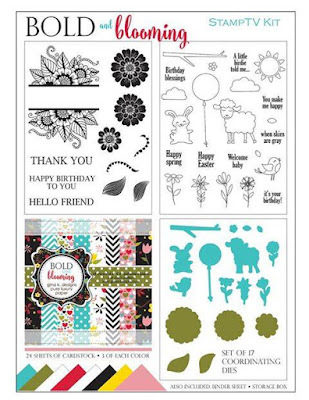 These stamps are so much fun and are perfect for spring! 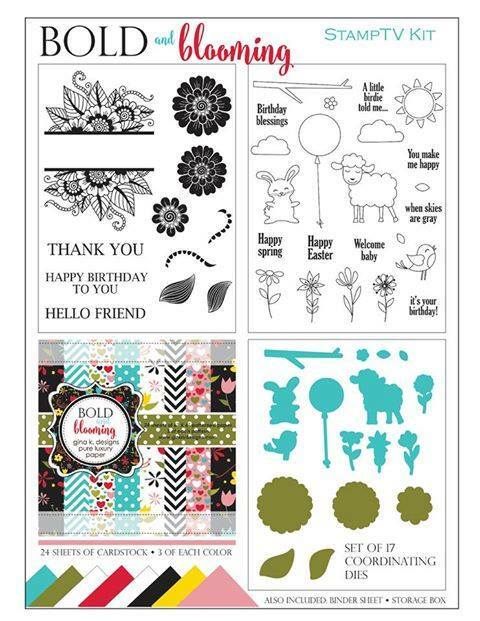 You will be able to create amazing card projects using this beautiful stamp set! Please welcome our new team member Rema DeLeeuw. Rema has a fun and clean style and loves to work in watercolors and ink blending. You will instantly fall in love with her projects! Next, I created a super simple design with the images in this set. I embossed the floral piece and then embossed a chunky flower and die cut it to layer it on top. Beautiful cards! Happy to see you back in action in the blog hop. A special treat to see you and your work here once again! Gorgeous! Lovely, elegant and oh so fun! This is such a versatile set! Welcome back!! I love your work. Hope to see lots more of it. These cards are terrific. Love all your cards. So beautiful. that kraft one just is so fun. Welcome back. Love all your cards-absolutely gorgeous! Beautiful cards, thanks for all the great inspiration!! Love the cards, the one on kraft is my favorite. Thanks for the inspiration. Love your cards and the rounded corners adds the perfect touch . You really show cased the new stamps perfectly. The happy birthday card is gorgeous, Love white embossing. All of them are great cards. Just got my SOTM kit and love all your wonderful ideas. The white embossing is great and your cards are not just beautiful but "springy" and since we just had a late winter snowfall, I need to bring some warmth into my card making. Carolyn, welcome back! Lovely cards. Thanks for the inspiration. Great cards! Beautiful coloring on the first one! So very nice to met you and thanks for the eye candy and inspiration. Well I really love all three of these!! Beautiful coloring on first & love the bright colors on your 3rd. The one on kraft is so soft & pretty...I would not think to do that and its beautiful! These are all fabulous! I just love the Kraft design so different than anything else we've seen, a great look! and I love how you mixed those sentiments on the last card! Beautiful cards. Love your copic work. Great to include cards that even a newbie can try. Ooo, love them all! Welcome back!! Stunning cards Carolyn! So happy to be working with you this month. Love your cards! They are beautiful! Thanks for sharing! I love all three! Great job! I was sooo tickled to have you back with us this time around! Hope more often! You have not lost that touch Camster! Beautiful. Love the cards and what one stamp set can do. Welcome back. It's nice to see your lovely cards again. Wow Carolyn, love your cards! I especially love the kraft one. Thanks for the inspiration. The split stamp is wonderful. Thanks for sharing. Lovely card, the "Thank You" card is really colorful, makes you think of Spring. Oh yeah, welcome back! Ohhh, love that first card especially and the colors you chose!! So wonderful to see your beautiful work again. I really love the beautiful colors of those designs. Beautiful floral cards with these new stamps. 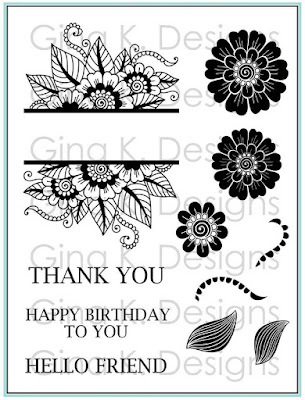 Thank you for showing the versatility of this stamp set! 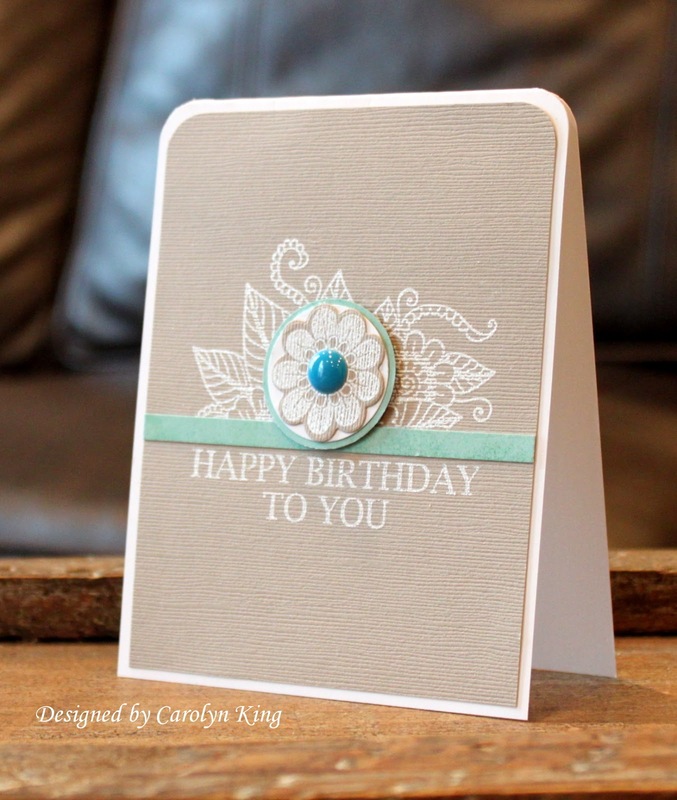 Carolyn, love how you used the green polka dot paper that Gina used on her cards. Love the embossed one also. TYSM for sharing. Your cards are beautiful. Particularly love the thank you me. Welcome to Stamp TV! I absolutely love your cards. The Kraft one will be "borrowed" tomorrow, for sure. Beautiful projects. Your style is awesome! Love all of these. They are beautiful! Beautiful cards! Love your fabulous style! All 3 of your card examples are lovely. I really like the first one and I think it is because it is offset. Thanks for sharing. Lucky for us for your guest appearance today! Thank you for sharing. Love the embossing and really love the fun colors of card #3. Makes me think of a lovely summer day! Your cards are all amazing! Love the designs and I'm crazy about this stamp set. Looks Amazing Cammie! Love them all! There is no way to make a bad card with this beautiful set. Gorgeous cards. Gorgeous designs! Glad to see you back! love all the cards. Can't wait to try it out. Thank you for sharing your design with all of us. 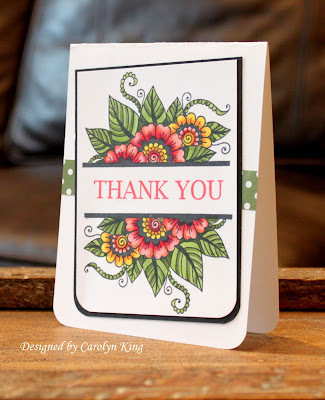 Thanks for sharing these beautiful cards, Cammie! Stunning and gorgeous! Welcome back! I love all of these and your colouring is awesome. Wonderful card designs Love them all. So pretty! Love your style! Your coloring is fabulous. Thank you for all the inspiration. Oh heavens I thought I could pick just one that I love, but I can't. They are all so great.